Chief rabbi of Cracow; born about 1547; died at Cracow Oct. 17, 1617. 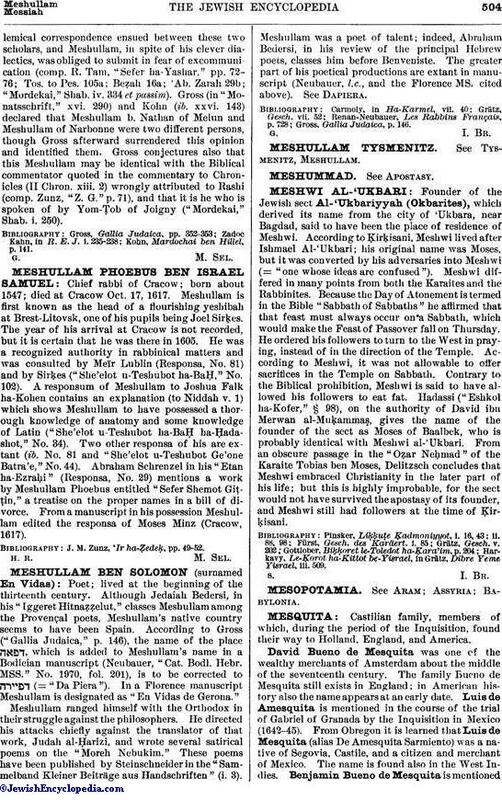 Meshullam is first known as the head of a flourishing yeshibah at Brest-Litovsk, one of his pupils being Joel Sirḳes. The year of his arrival at Cracow is not recorded, but it is certain that he was there in 1605. He was a recognized authority in rabbinical matters and was consulted by Meïr Lublin (Responsa, No. 81) and by Sirḳes ("She'elot u-Teshubot ha-BaḤ," No. 102). A responsum of Meshullam to Joshua Falk ha-Kohen contains an explanation (to Niddah v. 1) which shows Meshullam to have possessed a thorough knowledge of anatomy and some knowledge of Latin ("She'elot u-Teshubot ha-BaḤ ha-Ḥadashot," No. 34). Two other responsa of his are extant (ib. No. 81 and "She'elot u-Teshubot Ge'one Batra'e," No. 44). Abraham Schrenzel in his "Etan ha-Ezraḥi" (Responsa, No. 29) mentions a work by Meshullam Phoebus entitled "Sefer Shemot Giṭṭin," a treatise on the proper names in a bill of divorce. From a manuscript in his possession Meshullam edited the responsa of Moses Minz (Cracow, 1617). J. M. Zunz, 'Ir ha-Ẓedeḳ, pp. 49-52.